We served our first meal in October 2017. 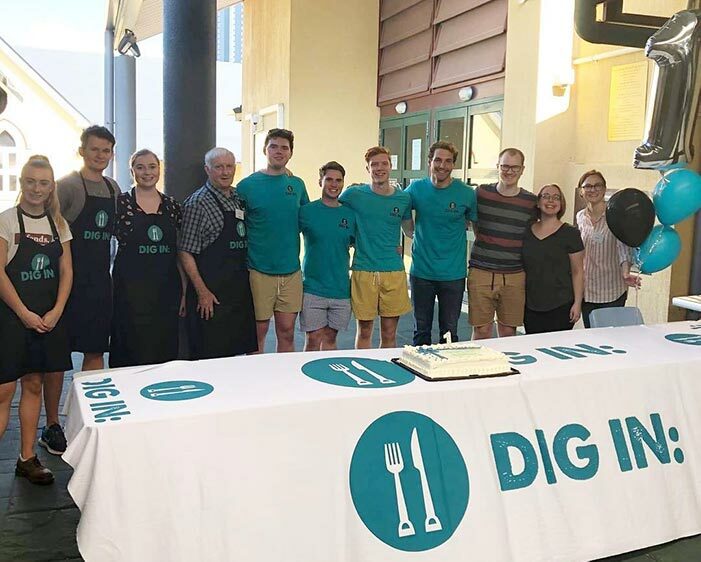 Dig In was established by a group of like-minded entrepreneurs in 2017 with a view to creating the most inclusive and accessible charity in Brisbane. We value working together as a community and aim to achieve this by engaging people from all walks of life to help those in need. Different groups bring different skills, ideas, and values and by working together we can find the best possible solutions for helping others. United behind this common purpose, we aim to develop a platform to do some good and make a difference in our community. Our objective: improve access to wholesome meals. Our primary goal at Dig In is to ensure every disadvantaged person in Brisbane has access to a filling, nutritious and wholesome meal. We engage our community to provide their invaluable experience and expertise to fund, cook and serve our meals. We are constantly searching for additional funding sources to allow us to further develop and expand our charitable endeavours. Our founders have taken part in charitable work both in the Brisbane area and overseas. Our experience ranges from volunteering in the local Brisbane area, to helping construct schools in the remote parts of the Borneo jungle. In establishing our own charitable organization, we hope to cultivate a sense of community as well as make a real difference to the lives of those in need. Our organization is structured to limit unnecessary costs and extract the maximum value from our funding to benefit the most people. We work tirelessly to ensure every dollar donated is spent as efficiently as possible, while constantly seeking innovative solutions to fund and expand our mission.